ANNAPOLIS, Md., Oct. 18, 2018 /PRNewswire/ -- The Chesapeake Bay Trust and the Maryland Department of Transportation Motor Vehicle Administration (MDOT MVA) revealed the new design for Maryland's Chesapeake Bay license plate during a special unveiling ceremony today. The newly redesigned plate features two prominent Chesapeake icons: the blue crab and the Chesapeake Bay Bridge. Sales of the Chesapeake Bay license plate support funding for K-12 outdoor education, environmental restoration projects, and community engagement in natural resources. The new plate will be available for purchase beginning Monday, October 29, 2018. The unveiling of the new plate, frequently referred to as the Bay Plate or Chesapeake Bay Plate, is the culmination of an extensive process that engaged multiple Maryland-based artists and incorporated input from thousands of Marylanders who considered over 250 alternative designs. Ultimately, TM Design, a Frederick-based design firm and member of the Maryland State Disadvantaged Business Enterprise (DBE) Program, created a design that won the majority of survey respondents' votes and resonated with Marylanders' desire for a plate that evokes "Chesapeake Pride." "The Maryland Department of Transportation is proud to partner with the Chesapeake Bay Trust and support its efforts to restore and protect the Chesapeake Bay through the Bay Plate," said Transportation Secretary Pete K. Rahn. "MDOT MVA is pleased to offer this new option to Maryland drivers," said MDOT MVA Administrator Chrissy Nizer, whose agency administers the Bay Plate program. "We look forward to providing premier customer service to all those interested in purchasing the new Bay Plate at one of our branches or through our convenient web services starting on Monday, October 29th." "We are so proud to have worked on the new Bay Plate," said Tina Cardosi, president of TM Design. "It will be an honor and a thrill to see our work on so many vehicles on Maryland's roads and beyond. Knowing that this plate will help to improve water quality and our natural resources throughout the state is incredibly rewarding." "We are thrilled to introduce this iconic Chesapeake Bay Plate that captures the essence of where we live," said Jana Davis, PhD, Executive Director of the Chesapeake Bay Trust. "By asking for the Bay Plate, drivers help to get kids outside on field trips and trees and gardens planted across our communities, all of which helps the Bay and its contributing rivers and streams." Maryland has made significant progress in restoring the Chesapeake Bay in recent years. Under the Hogan Administration, the state has invested a historic $4 billion in Bay restoration initiatives. The Chesapeake Bay recently received its highest recorded grade in the University of Maryland Center for Environmental Sciences annual report card, and Maryland's coastal bays hit a historic high mark in the 2017 Coastal Bays Report Card from the Maryland Coastal Bays Program. The Chesapeake Bay Trust is a nonprofit grant-making organization dedicated to improving the natural resources of Maryland and the Chesapeake region through environmental education, community engagement, and local watershed restoration. 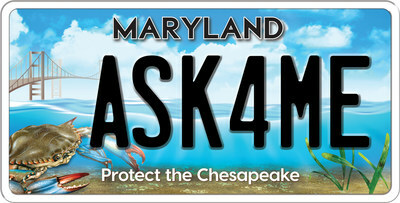 The Trust is supported by the sale of the Treasure the Chesapeake license plate, donations to the Chesapeake Bay and Endangered Species Fund on the Maryland State income tax form, donations from individuals and corporations, and partnerships with private foundations and federal, state, and local agencies. The Trust has received the highest rating from Charity Navigator for 15 years: 92 percent of the Trust's expenditures are directed to its restoration and education programs.